The Hill Country Tea Party Patriots held a Senate District 25 candidates forum in New Braunfels and the audience was eager to hear what the candidates had to say. Dr. Donna Campbell is challenging Texas Senator Jeff Wentworth, who has been in the Texas legislature since 1988. Wentworth’s other challenger is Elizabeth Ames Jones who has lowered her sights by switching from running for US Senator to a Texas State Senator. Each candidate was given 15 minutes to speak and a question and answer period followed. The dialogue that the candidates used was extremely feisty. There were times you wondered when the knockout would come. I have to say that it was Dr. Donna that proved to be the winner. She was the only candidate who received rousing applause after some of the points she made. There is something about Dr. Donna that energizes your inner soul to stand with her. She is a petite fireball and is someone who is ready for action, ready for duty, ready to work for the constituents of Senate District 25 and she is someone to reckon with. She has the ability to warm your heart while pumping new life into it! She is just what Senate District 25 needs. 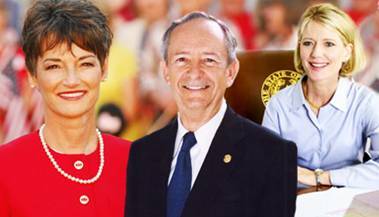 In the last election 2010, Dr. Donna ran against the incumbent Congressman Lloyd Doggett and surprised him by almost removing him from office in a very close race. 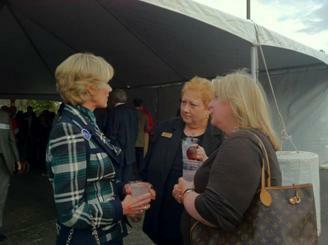 There is no blurring of the lines with her as she stands firm for limited government, a balanced budget and Pro Life. For some time now it has been very evident that Wentworth has taken a lackluster view of what his duties as a conservative Texas Senator should be. He has gone ‘job hunting’ and has been rejected. The position of vice chancellor in the Texas A&M System with a salary of over $200,000 compared to the $32,000 biennial amount he makes as a Texas Senator was quiet enticing. He had endorsement letters from Democrat Senators Carlos Uresti, Judith Zaffrini and Rodney Ellis. He also had the backing of Ed Whitacre who became head of General Motors Company after the government bail out given by non other than OBAMA. You have to wonder why Wentworth had 4 out of 5 supporters affiliated with the Democrat Party write recommendation letters for him. Senate District 25 needs new energy and a new commitment to our conservative values. The one thing I can say for Wentworth, after listening to him at several events and forums, is that he has somehow lost his way. He has forgotten the grassroots people who put him in office. His humble beginnings have given way to his elitist persona. He once said to a large audience that he did not have to listen, “I am not obligated to follow the Republican Platform where people meet once every two years.” In fact, he is so complacent that he doesn’t even bother to change his story line. He is still wooing his constituents with the same boring rhetoric. At the meeting I attended a little over a year ago he said, that he bumps into people all the time at the mall, church, restaurants and he answers their questions. That he is always there to ‘help’ his constituents and how transparent he is. He should have the courtesy to address his constituents with a more welcoming acknowledgment. His reasoning for wanting to be reelected is for the purpose of proposing a Constitutional Convention. I have provided links to Wentworth’s voting record and other evidence why he should not be reelected. He openly flaunts his Pro Choice stance without apologies. He voted not to give a voice to the unborn baby by voting against the Texas Sonogram bill. The following statement is taken directly from his campaign material. ON ABORTION – On abortion, I do not fit in a simplistic pigeon-hole or little box on this issue. I support, and have consistently supported, current Texas law which bans abortion in the third trimester. I am a Senator Barry Goldwater traditional conservative who believes that we should get government off of our backs and out of our private lives – and I strongly oppose Obamacare which would have big government interfering with the doctor-patient relationship. Texans are entitled to decide, in consultation with their physician, on their medical treatment without the government’s trying to practice medicine. This is Wentworth’s way of saying that he is Pro Choice. This last August when Elizabeth was in the midst of running for US Senator, I interviewed her concerning the US senate seat. She was able to describe perfectly her job as the chairman of the Railroad Commission. She even went so far as to tell me how proud she was serving as the RRC, “I am the longest serving woman on the RRC only the second elected in over a 100 years and I am just telling you this because I am a Republican woman and I want to inspire other Republican Women to step up to the plate and know that in fact they can become leaders now and especially unique in the oil industry.” Actually, I wondered then why she would want to leave a position she thought so much of to run for a US Senator. But now that she has switched again, I really wonder why she is willing to take such a huge cut in pay from $115,000 per year to about $16,000 per year. According to Paul Burka from BurkaBlog of Texas Monthly, Elizabeth owes the Texas taxpayers over $30,000 in pay she received from November 1, 2011 up until the time she officially resigned. http://www.texasmonthly.com/blogs/burkablog/?p=12651 She moved back to San Antonio and the Texas Constitution Art 4 Sec 23 states that she should have been a resident of Austin while employed by the state. As told by Wentworth, there were four other men approached to run against him before Elizabeth ‘took the bait’. Just as Dr. Donna has the passion and the ability to articulate her positions, Jones’ indifference shows. She spends her time defending the positions she took during her tenure in the House. And while she professes to be a Pro Life advocate, records indicate that she is not a strong proponent for Pro Life. 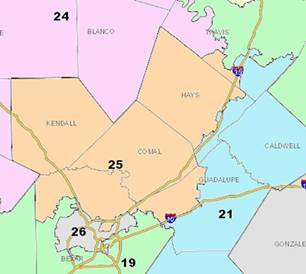 While in the Texas House she represented House District 121 the same HD that is presently held by Speaker Joe Straus. Her apparent friendship with the Speaker could prove to be a millstone. It is important that we choose wisely, that we do not trade one entrenched elitist politician for another. 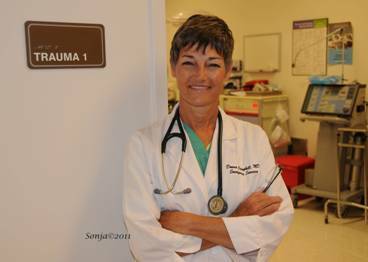 Dr. Donna will breathe new life into SD 25. If you do not know who your Texas Representatives are just click on the link WHO REPRESENTS ME! We the Veterans of District 25 Fully support Dr.Donna Campbell for Senate.